VisualDx is the single source for diagnostic clinical decision support. 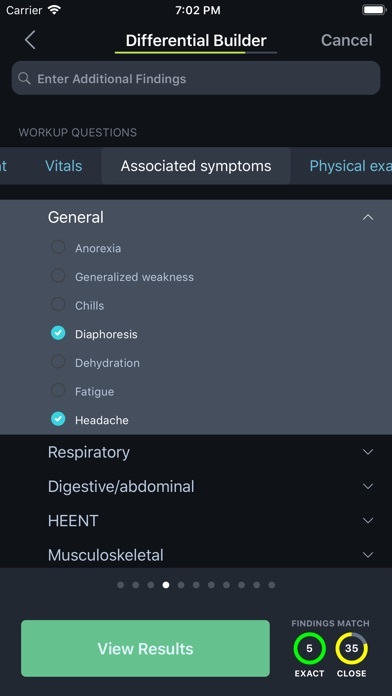 Searchable by symptoms, signs, and patient factors, VisualDx is the fastest path to a customized differential diagnosis. Tens of thousands of images and graphics speed comparison, recognition, and diagnosis. VisualDx is used to validate a diagnosis, access next steps for management and care, and for patient education. The VisualDx decision support and reference tool for physicians includes more than 3000 diagnoses and over 41 000 medical images. REQUIRES a VisualDx subscription; see below for details. VisualDx combines expert medical knowledge, standardized terminology, intelligent search, and the best medical images to deliver concise and accurate answers. Search by diagnosis, build a patient-specific differential, or look up drug-induced adverse reactions by medication – all at the point of care. 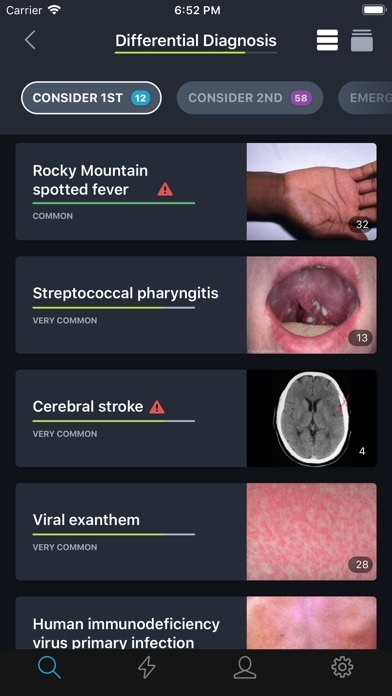 VisualDx Mobile is the ONLY professional medical app to show disease variation with images. With VisualDx you can: · Quickly search by diagnosis for next steps on management and patient care. · Visually confirm a diagnosis by comparing medical images to your patient’s presentation. · Review diagnostic pearls and best tests at the point of care to aid with diagnosis. · Build a custom differential based on your patient’s signs, symptoms, and other key findings such as travel history. · View over 43,000 drug reactions · Provide on-the-spot patient education with real medical images. · Access ICD-10 and SNOMED CT codes. · Perform VisualDx Quiz to test your knowledge of visual presentations of disease, and compete against colleagues via leaderboards. Over 1700 hospitals, clinics, and medical schools use VisualDx to aid diagnostic accuracy, enhance medical education, and improve patient outcomes. INSTITUTIONAL SUBSCRIBERS Launch VisualDx AT YOUR INSTITUTION and click the “VisualDx Mobile” link to register for a personal VisualDx user name and password to use on your mobile device. INDIVIDUAL SUBSCRIBERS CURRENT subscribers: use your existing user name and password with VisualDx Mobile. NEW subscribers: sign up in the app to start using your VisualDx free trial. I have been a user of this app for >3 years from dermatology residency to clinical practice as a board-certified dermatologist. Very easy to navigate and nearly comprehensive listing of dermatological disease. Whether you are using it as a learning tool (med student, resident) or clinical assistant (ED, IM, dermatology, etc.) it is a “must have” if you encounter cutaneous disease in practice. 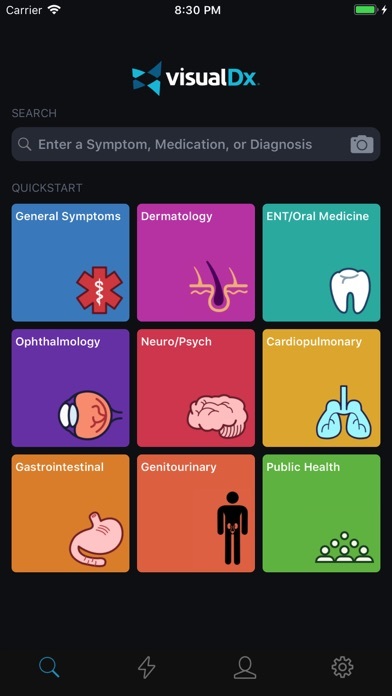 I use the app multiple times a day and use it to assist with diagnosis, differentials, quick treatment guide, and most importantly as an education tool for the patient. I often will pull up a known diagnosis and show the patient similar photos to their condition from the expansive photo bank to help support a diagnosis. Furthermore, i frequently print out patient handouts for patients so that they have a reliable and physician-vetted document to help answer any questions that remain after our patient encounter. All in all, this is the single best and most used app I use in clinical practice as a dermatologist. Very useful for med students to experienced physicians and I highly recommend. I have been using VisualDx app for about 3 years and I have to say it is the best purchase I have spent. I use this app for patient education as well as for my own education. It is very user friendly and the information is informative but not overwhelming. I use it everyday and I am very happy with the app. The app developers put in a checkbox for the EULA that is off of the iPhone SE. Can't check it to start using. Most useful, most fun Derm app! 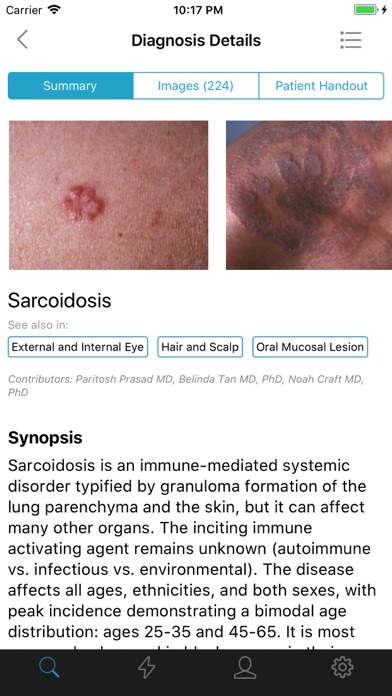 I know this app covers several fields in medicine, but as a senior dermatology resident, This is the best dermatology app available. By just tapping (or typing) in the findings you have, VisualDx creates a personalized differential replete with pictures you can run through to confirm you are on the right track. Then you can read about--or look through more pictures for--the diagnoses you find most useful. Everything you need, from links to more similar-appearing diagnoses, to therapy help, to printable patient education, is all immediately accessible. One of my favorite features is that there are numerous clinical pictures of patients with skin of color. I don't think any other resource can compete. I have wholeheartedly recommended this app to my friends in dermatology, family medicine, internal med, emergency med, and pediatrics for years. I originally bought this app for a dedicated derm /ID source! Pictures, information and content was Fabulous!!! THEN they updated and now is not user friendly, you cannot find anything w derm like before. I will not be renewing my subscription. Ok, but old version was better. The new version looks more "modern" but is much more clunky and difficult to use. Navigating was very simple and intuitive but now I've had a harder entering info (or finding where to enter certain pertinent positives). 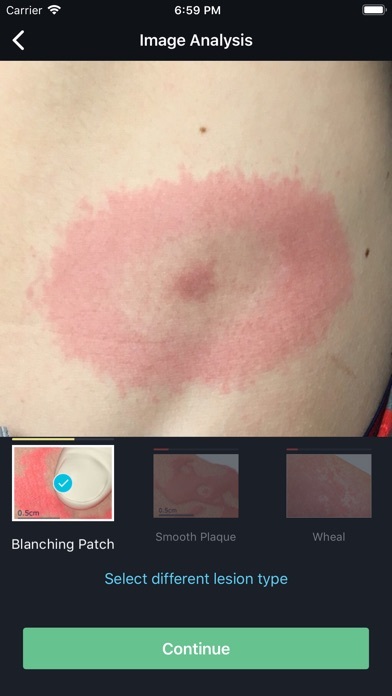 I am an IM resident and previously this app was my go-to for skin conditions or a physical exam finding that I wasn't sure about. When using an phone app most doctors want it to be very simple and easy to use. The old version was perfect. Even the most technologically challenged physician could easily navigate the app. With my huge medical school debt I have to be very picky on what I spend money on and previously this app was worth it to me, however I'm not sure I will renew my subscription (at least in the current state of the app). I really hope they clean up the layout because the underlying information in this app is top-notch. I found this app to be useful while I was a dermatology resident and was given access at a discounted price. When I discovered how much I had been charged for subscription renewal immediately after residency, I was shocked at the full price. I contacted the company to request cancellation of the subscription with a prorated refund, but they ignored the request. Bottom line is that it's too expensive for what it is. Jut updated to new version. The quiz feature is no longer working on my iPad. This feature is important to reviewing for my upcoming Derm boards. Please fix and I will re-review!